Since 1980, Raunak Group has been a leader in providing luxurious apartments with world class amenities. Catering to the housing needs of Mumbai, Pune, Kalyan and Thane, Raunak Group have always worked for elevating the living style of its home buyers. Successfully developing various township projects over the years, with 4.9 million sq ft. of completed projects and additional 2.7 million sq ft. of ongoing developments, has made them the foremost players in the real estate game. Inspired to redefine the fundamentals of housing, Raunak Group have always reinvented themselves for time to time. Fulfilling the ever rising demand of a perfect lifestyle, they have always enhanced and excelled their features. Whether it be timely deliveries, affordable housing, transparent relationships or the quality, it has made them an outstanding choice in the world of real estate. Carrying on the legacy of 37 years, Raunak Group has built a name, in the real estate sector, known for their quality and timely delivery of the properties. 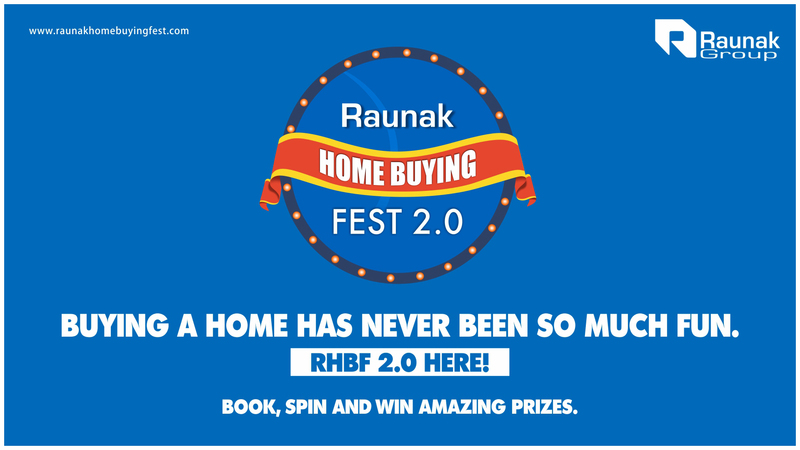 Now they are back with their biggest discount campaign of the year, Raunak Home Buying Fest 2.0. An exciting real estate festival of Mumbai, where the buyers will find the biggest discount, ever to witness, for the region of Thane and Kalyan. This home buying festival is the celebration of giving home owners, a place of their choice. Reaching to the core needs, hence bringing out their dreams to fulfilment is the prime motto of Raunak Group. On every booking at the Raunak home site in Thane and Kalyan, the buyers will get a chance to spin the wheel of fortune, making it a sure shot chance to win amazing prizes. Raunak Group’s Home Buying Festival is an offer that shouldn’t be missed. As for the first time, real estate sector finds discounts on a staggering level that have never been seen before. Uniquely designed, this festival gives the buyers an opportunity to book their dream homes. The wheel of fortune provides an exciting list of prizes, there is a special discount waive-off of 3 months EMI. Surprisingly there is also a step-up to this offer, another wavier of 6 months is available on the wheel. Special vouchers ranging from 1.25 to 2.5 lacs can also be won at a lucky spin. This discount spree gets even more exciting, as the lucky players might win 15 to 20 grams of gold at each swing. Everyone’s a winner at Raunak Home Buying Fest. Buying a home has never been so much fun!